Are Your Fixed Ladders Compliant? With OSHA’s new Fixed Ladder Standard taking effect this November, it is important for us to be prepared. The new ruling states that as of November 18th, 2018, OSHA will no longer consider cages compliant fall protection, in new ladder systems. OSHA is giving workers the time and opportunity to update all cages by November 18th, 2036. In 2036 OSHA also deems ladder cages no longer acceptable as fall protection. In addition to cages not being compliant, a fall protection system or ladder safety system will need to be installed to current ladder systems 24 feet or higher. ALL fixed ladders installed or repaired by November 19th, 2018 MUST have compliant fall protection . Why Are Cages Being Phased Out? Fixed Ladder Cages do not offer the same level of protection as fall protection systems. For instance, if a worker slips from a fixed ladder, the worker will have to stick his or her legs and arms out to brace his or her fall. The worker is likely to sustain bruises, cuts and broken bones caused by the impact of the metal cage, if the worker manages to catch themselves. 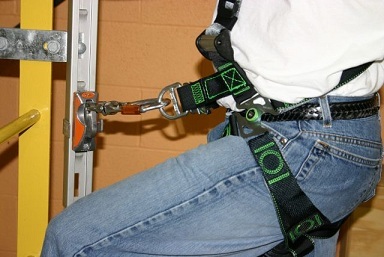 If the worker fails to catch them-self, they will fall to the ground, facing potential fatalities in the workplace. There are a variety of ways and product to help you stay compliant. A very safe and cost efficient way to stay compliant is to install a ladder safe cable or rail system to your fixed ladder. A Ladder Safe system such as the Miller Glide-Loc will keep you compliant on your jobsite.